It's done all the time. There are very specific steps you'll need to take . If memory serves, you'll need to contact FL DMV and declare your intention. But you also have to apply to DOT and more important COB ( customs ). The Florida DMV website should be a good starting point. I presume you have a clean title , a current registration . I have no idea if your country of origin has exit requirements. Good luck. This is common for early 996. There are many thread devoted to this problem up here. That being said, Things wear out. I've done the left one on my 2000 C2 coupe, and recently my right window is acting up. The common issue is usually the window regulator. There a 3 micro switches I believe for each door? First try the relearning procedure on the window. It may have just forgot it's open and close parameters. If that isn't the issue, then isolate if it's acting only from the inside door handle or the outside door handle. If it fails on that, then it's likely the regulator is worn. Either way, it will require removing the door placard etc to resolve the problem. It's not an expensive repair, and offers the opportunity to replace everything related so you'll never have a future issue. Good luck. My new 996? Please help me decide! Try searching from this source www.pcarshops.com the car looks clean, and the owner has done a good portion of the things that need attention. For what its worth, shipping cars from long distances is common with Porsche. Ive done it 6 times and never had any surpirises I didn't expect. If the car checks out, I hope you plan on shipping enclosed/liftgate. New 996 Owner Here, Suggestions, FYI's Would be apprectiated..
Congrats on the 996. To answer your question, spend time on this site. there are good folks here. if you have a serious question, which you will, reach out to Loren directly. For what its worth, if you plan on keeping the car , then do everything an 80K car will need. 996, like any Porsche 911 has a fairly well documented history of things that break/wear out. At 80000 miles, you are at the point where stuff happens. So,,, yes, do the IMS, do the rear seal, the AOS, bellows and ALL the coolant lines, as well as the **** coolant tank, including a new sending unit and the blue pressure cap upgarde. Do the water pump, and thermostat while you are at it. Clean out the throttle body, etc. Yes do the clutch, etc. I doubt the flywheel is out of round or damaged. Not sure if your year was a single or double. Radiators will be another area to keep an eye on. Theyre cheap in comparison to over heating an M96 block which will render you 996 into a very expensive lawn ornament. If the car trani is manual, its the perfect time to refurb it. If the car whines coming off of Hi Rev driving or you have 2nd gear pop out, or synrchros that clunk, then its time to rebuild it. I did all of this on my 00 C2 6MT coupe at 92000 and have had zero problems since. Car is now well over 100K and humming along as good as new. The peace of mind far out weighs the costs. Plus , it WILL help future valuations when you do sell out of it. Why spend $2K now , only to have to spend another $2K 6 months from now, and that much again 6 months later. Goodluck. Keep everyone posted. Ahsai is correct on all counts. I had a similar mystery leak more than a year ago ( MY00 996 C2 coupe 6MT ). Florida is hot and any defect on water cooling will show up especially in stop and go traffic. after any normal drive around town drive, I noticed the tell tale sign of a coolant tank leak as I had drips of coolant dropping off the left rear tail pipe. then I'd notice sometimes a small spot under right front wheel. a normal pressure test showed everything to spec. so we over pressurized to about 18ppsi and found both a flex leak in the tank neck as well as a definite Rad leak. I replaced the coolant tank including the new blue cap, sensor and hoses. and got a set of new factory Rads along with all new hoses, etc. you'll be surprised with how much road crap gets wedged in and trapped around and in between the Rads and the condensers. I was doing a major refurb and had replaced water pump, etc, so the additional fix's only made sense. good luck. you'll get it fix'd and shouldn't have anymore issues. during summer months here my dash guage wanders from splitting the 180 mark and will wander north of it depending on the ballasts/fans kicking in. if its motor meister in Downey, CA, they've had issues in the past. Google them and see what current reviews are. thanks for posting this. If Im looking at the pictures correctly, those may be the drain tubes. I would love to know what and where the clear plastic tube goes to ? if I remember correctly last time I did this, it was far easier and better to remove bumper cover, since it gives you total access to everything up front. Easier to work on too, plus you can do maintenance on the rads and condenser, inspect them for any issues, make sure the lo tone and hi tone horns are working, etc. those hose clamps, if still factory are pressure closed, so be careful, or plan on replacing with similar spring clamps or screw type. if you're trying to keep OEM, Brian Farmer - Einmalig in Huntington Beach has pretty much all of that correct harware. its cheap and guaranteed. cant go wrong. hope this is of value. Refitting 996 front bumper issue - any ideas? While watching Olympics and scanning Gear&Gadgets, I stumbled on a couple of cool retro technologies that look promising for cars from 1996 to present. Fortunately for me, the previous owner spent some bucks ( $4G's) on my 996 installing JL audio amps, cross overs, alpine speakers, subs and a Kenwood 7" DVD, Sirius, XM satellite, iPod, Garmin NAV head. I always wanted to complete the trifecta and add Bluetooth, but the units are almost extinct and real pricey. A company called SUPERTOOTH has a neat little unit that clips on your visor , is self contained and pairs to iPhone and Android phones. Cost is $90.50. Since its portable, it can travel to your other car etc. Sweet. Anyone using it? ( www.supertooth.net ) The other interesting product is an OBDII scanner called AUOTMATIC. ( www.automatic.com ). For $100, you get a plug in unit that stays with the car and feeds you all kinds of real time information including monitoring for codes , CELs etc, gas use, GPS, route directions . It pairs with iPhone, Android. According to their website, Porsche 996 is compatible. Im tempted to try both, but wonder how useful the scanner really is. Noob - Nervous and need some experienced help! Rich. 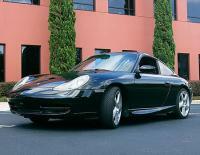 Moving into an unfamiliar car and especially a 996 thats over 10 years old and 5 hours away requires due diligence. There are too many facets to evaluate via emails , pictures and phone calls with the seller. I would strongly suggest sourcing a qualified Indie Porsche shop to have a thorough PPI done. www.pcarshops.com is a good starting point. Find one in relative distance to the owners location and require the car to be dropped off. Address your concerns and wants with the techs. Among the things that should be done beside bumper to bumper visual inspection and normal fluid checks, etc, etc, etc, you should also interrogate the DME even with a tip transmission. The shop will probably have durametric software at a minimum and perhaps even have PST2 and PIWIS. 996 is a complicated car with many electronics. Anything 10 years old will need attention, and parts do wear out naturally, so its a good idea to know what you're heading into right upfront. Having a thorough report also protect both you and the seller believe it or not. If you discover un disclosed issues, it gives you the ability to either negotiate or walk away without problems. The PPI may cost you $200-300, but its well worth every penny before you plunk down $20G+ and drive 5 hours. For what its worth, Ive been refurbing my MY2000 996 coupe RWD, 6MT for about 3 years now. I got the car from Matt and Gary at Oklahoma Foreign, one of the oldest PCar parts shop in the Porsche community. After an intensive discovery and settlement on a fair price, Ive spent north of $15K tearing things apart and replacing suspect items. The car now is 100%, but its been a learning experience. A fun one, but still time and costly. good luck and welcome to the family.